Aubrey & Matt are Fun In the Sun Weddings’ newest newlyweds! 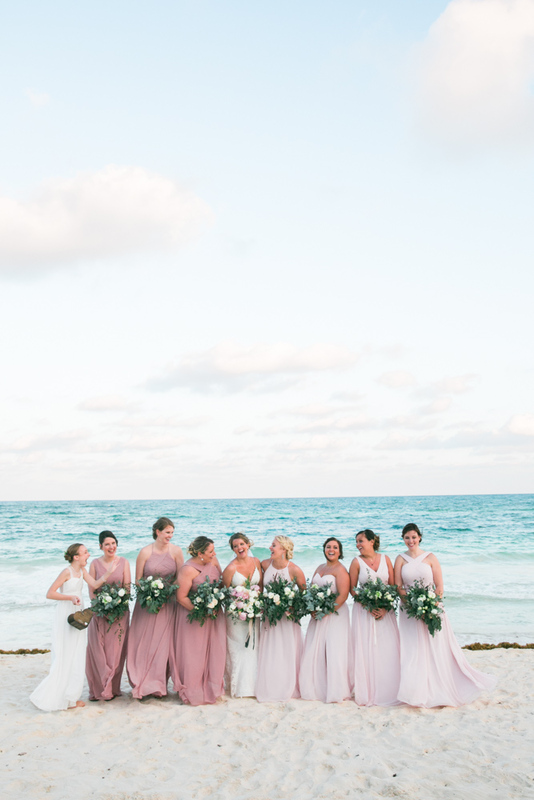 Their Ak’iin Beach Club wedding in Tulum left the bride in awe of her Pinterest board come to life, and their wedding guests say it was the most beautiful wedding they have ever been to. Although Aubrey and Matt’s grandmothers grew up on the same street, and the bride and groom were raised in neighboring towns, it took Match.com to finally bring these soulmates together when the time was right. Aubrey always dreamed of a beautifully intimate, unique, non-cookie-cutter destination wedding, and this is what led her to get married in Riviera Maya at The Ak’iin Beach Club with the help of her incredibly talented wedding planner, Kristee at Fresa Weddings. Aubrey jumped into DIY projects, and loads of little details were made with love: wedding invitations, dinner menus, fans, favors, signs, and gold name cutouts at every guests’ seat. Anything that was not handmade was instead custom made off Etsy. Their wedding day was perfect, but out of all the amazing moments, Aubrey’s favorite was watching Matt tear up as she walked down the aisle and as they exchanged vows. Her advice for the bride-to-be getting married on the beach in Tulum? Be present. Take a minute to take a step back and take it all in. It truly goes SO fast. If you can, hire a videographer to capture the day. Aubrey and Matt, thank you so much for your confidence and trust in allowing us to capture this amazing moment in your lives. We wish you all the happiness in the world in your marriage and Congratulations! If you are looking for the best Tulum wedding photographer to capture you getting married on the beach, then contact us today! We are Fun In The Sun Weddings, the best photographers in Tulum, Mexico. Would you like to know what others think of The Ak’iin Beach Club? Check out unbiased reviews on Tripadvisor here. Ahhhhhhh!!!! These are incredible!!! Thank you so much for capturing our photos and making us laugh through the day!